Sorry to any readers in other parts of the world. This week's post is decidedly Canadian. We need to get very clear about something. When a young person takes a risk to tell us oldsters something important, we need to listen — not criticize! I was away at an educational convention this past weekend, and came home to news that Canada has a new hero! 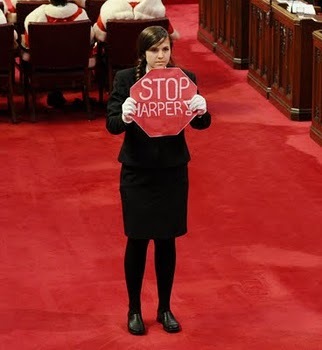 Brigette Marcelle DePape was a page in the Canadian Senate who simply couldn't listen anymore without "saying" something. Why is it that Brigette's generation has all this courage while we elders keep denying that there's anything awry? So, Brigette does this brave thing (check out the video) and what's the response of the "elders"? • She disrupted the reading of the Throne Speech. Ah, no. She stood and held up a sign. Nothing disruptive there! The fact that the Senators were disrupted says more about how distractible they are or how boring the Throne Speech was. • She showed a lack of respect for democratic institutions. Ha ha ha ha ha ha ha!!! Oh my, if this one's true, we can certainly point to the man who taught her everything she knows. No, wait, his name was on the cardboard! Yeah, you know, the prime minister who was found in contempt of parliament! Besides something to do with hockey, it must have been a slow news week to turn this young woman's plea for sanity within our political system into a media circus. But do let's remember that our prime minister — not elected by a majority of Canadians — has sinister motivations that entail liquidating the future for Brigette's generation in the name of profits for his cronies today. Come on, CBC et al. Harper has already made a farce of our parliament. Quit pretending he hasn't. Meantime, Brigette Marcelle DePape just joined my list of climate change heroes. "For a young person to do that and to do it peacefully, and quietly and with grace, I thought it was a very powerful moment. Every now and then there is an iconic moment where an individual takes action, and it inspires others to think .... I think that Canada and Canadians probably need to put aside the full respect thing and bring out their inner hockey stick and get to work on preventing their government from turning into a version of ours." Wow, Evan Solomon makes me rage. "I'm not trying to dissuade you from having a political opinion..." but I will frame all of my questions so your political opinion appears disrespectful and illegitimate. - did I mention peaceful? Yes, Brigette is among the very few in our country who recognize that the future is quickly becoming a thing of the past. Bless her and her courage.